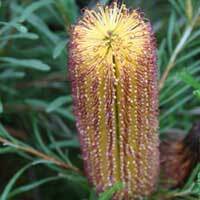 Some of the most widely grown native plants are the Banksia species. Attractive long lasting flowers, easy care and a number of varieties from low growing to large shrubs or small trees, make this a versatile genus. Species such as B. integrifolia, B. spinulosa and B. marginata are an Australian woody evergreen plant that can be found as a tall tree, or in a low growing prostrate form. Flowers form as a cylindrical form, dense and very colorful. Flowers range from yellow through to dark purple. B. integrifolia and B. spinulosa (picture right) are popular species readily available for sale from Australian Banksia Nurseries. An Australian Native Plant named after Sir Joseph Banks. With 76 species, these attractive long flowering plants produce stunning flowers and can add colour to any garden. Banksia are a great plant for attracting birds, prefer a well drained sunny position and can be kept in shape with light regular pruning. Some of the best flowering varieties are from Western Australia. These species in particular require a very well drained soil or may succumb to root diseases. Fortunately grafted versions of these plants are becoming more common in the eastern states. B. coccinea with its brilliant red flowers is perhaps the best example of this. If you could grow one species for the flowers, this would be the one for us. 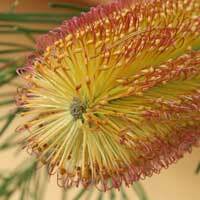 Popular species and varieties of include: B. aemula or Wallum Banksia, B. ‘Giant Candles’, B. ericifolia, B. integrifolia, B. robur and B. spinulosa. B. ericifolia Dwarf form is early flowering species with attractive red flowers, a little taller than other dwarf forms reaching around 1.5m depending on conditions. These are a hardy tree or shrub and require little water once established in the garden. Like many native plants they require excellent drainage and do well in full sun. Prune spent flower heads to maintain shape, regular light pruning will increase flower production, heavy pruning or cutting back into wood with no growth is not advisable. Some of the dwarf cultivars make excellent potted plants a free draining potting native plant mix is best. Fertilize potted plants with a slow release Australian Native Plant Fertilizer (these are low phosphorous). Mulch to maintain a cool root run and even soil temperature. Most species can be pruned, and the best way is to simply remove the spent flower heads. If you cut back to hard into old wood the plant may not re shoot. B. repens another from western Australian also known as ‘Creeping banksia’. B. serrata prostrate the yellow and pink tinged spring flowering Banksia ‘Pygmy Possum’ is a compact form that has a spread of 2m.